Street parking is not recommended, and the residential and business areas north of the NOS Event Center (North of Mill St) will be a tow-away zone. 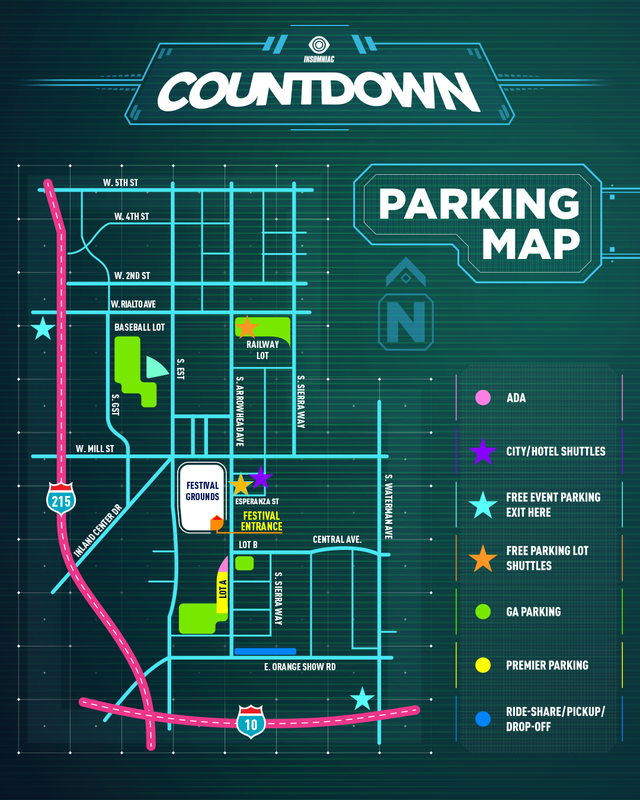 Premier Parking allows you to park closest to the festival entrance and be first to exit once the festival is over! Note: Premier Parking is not included with a VIP festival pass. Take EXIT 73B for Waterman Ave N.
Turn LEFT on E Central Ave.
Continue to S Arrowhead Ave.
Premier Parking will be straight ahead. FREE General Parking will be offered adjacent to the venue. These areas will be well lighted and patrolled by security teams during the hours of the event. Parking is at the vehicle owner’s risk. Please do not park in unofficial lots. Directions from the San Fernando Valley/Pasadena area: Take the 210 East to the 215 South, take exit 41 for South Auto Plaza Dr, turn left on Auto Center Dr, turn left on S Arrowhead Ave. Park in Lot A or B. Directions from the L.A./Riverside areas: Take the 10 or 91 East to the 215 North, exit Orange Show Rd, turn right, and then turn left at South Arrowhead Ave. Park in Lot A or B. Accessible Parking will be located near the VIP entrance off Arrowhead Ave. Directions from the San Fernando Valley/Pasadena area: Driving southbound on I-215, exit Orange Show Rd, turn left, and then turn left at South Arrowhead Ave. Directions from the L.A./Riverside areas: Driving northbound on I-215, exit Orange Show Rd, turn right, and then turn left at South Arrowhead Ave. Learn more about accessibility at Countdown. Vehicles must vacate the parking lot at the close of the festival. Any vehicles left in the lot after the festival will be towed at the vehicle owner’s expense. Rideshare/carpool if possible. 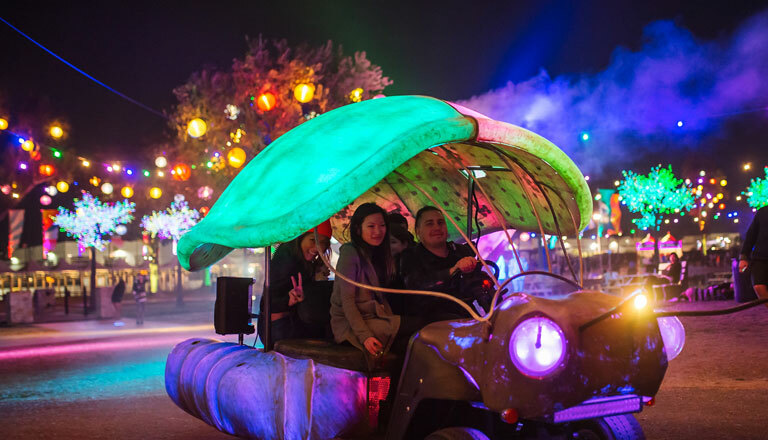 It’s not only good for environment, but it will minimize the number of vehicles accessing the grounds and help get you parked and into the festival faster! Plan to arrive early, so you can take care of parking and get into the festival without missing a beat. Remember where you park your car! Pin your location and take pics of nearby landmarks and signage. If you’re using a rideshare service, taking a taxi, or just getting dropped off by a friend, have your driver go to the designated Guest Drop-Off and Pickup location (look for signs), which will remain open for the entire event.